It's not a decent buy because all it does is increase the yield of our hunters, which we have barely any of even if we waste a turn putting her on the ring right now. We actually have quite a few hunters. If nothing else, this gives us another option for events where we can use any of our treasures for something or other. 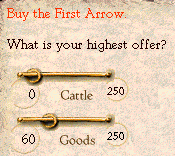 People are apparently sick of specifying numbers for things(at least the ones who posted before I started writing the update were), so I threw out a decent offer without spending all our wealth on a single hunting-boosting treasure. And now we have a new shiny! I wasn't joking about us having quite a few hunters. 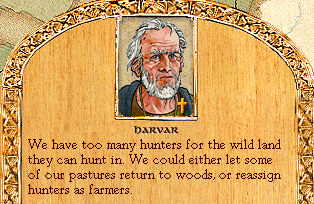 It hasn't been worth my time to convert them back to farmers, since there's always been something more lucrative to do in any given turn. In fact, we actually have too many hunters after last year's razing of the forests. 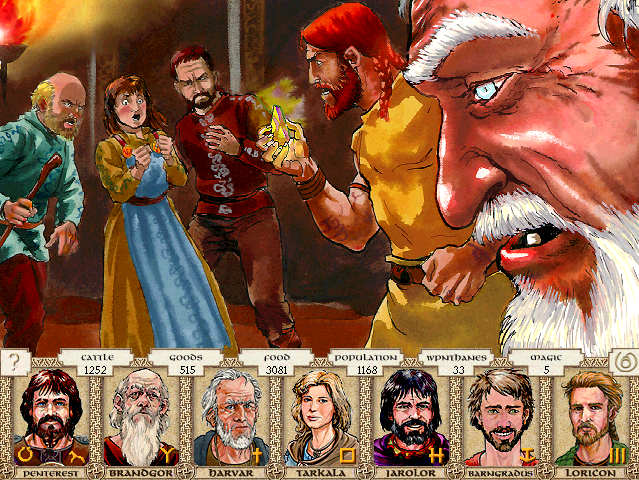 Thanes and priests from the Orleving clan come to accuse one of your young carls, Yerestia, of secret murder. "We found our revered god-talker Rana dead in the temple, a dagger in her back. We asked the spirit of our sacred rock, and and it said that one of your clan had done it. I hold in my hand a sliver of our sacred rock, and it tells me that this woman here is the killer. We demand you outlaw her, so we can take our just revenge for this most unholy act." -Convince them that their spirit is wrong. -Offer them compensation for Rana's death. Asking them to leave, or questioning the honesty of their spirit, will push them towards a feud with us. There's a big difference between an honest killing and secret murder. The former can be wiped clean by the payment of wergild, where the latter demands outlawry, and thus death, for the guilty. They're renowned for the martial power their rock spirit grants them. It will be very hard to convince them their spirit is wrong. I have known Yerestia since she married into the clan, and there is no chance she committed such a terrible crime. Our magic is strong. A divination will reveal all.